Aller sur le site internet de l'établissement en suivant ce lien http://gite.vertesmontagnes.fr. Rechercher de nouvelles dates disponibles en utilisant le calendrier dédié à chaque offre. The Vertes Montagnes (Green Mountains) gite, at the bottom of the Pyreneans on the GR10 hiking trail and at the heart of a famous stop on the Way of Compostela, is a perfect place for holidays with family and friends. Much more than a group house, this house is a true private house equipped and decorated for enjoying the mountain and the city. Presenting three floors and a green patio, totalling over 200 m2, 4 rooms distributed in a double room, a twin room, 2 bedrooms with a total of 9 single beds (2 bunk beds ), large living room of 40 m2 with 15 place table, equipped with home TV cinema , wifi free access and comfortable armchairs and sofas, large kitchen fully equipped, 3 bathrooms. 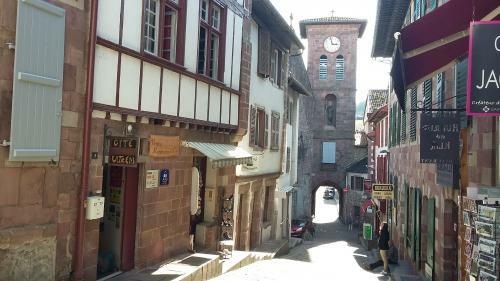 Saint-Jean-Pied-de-Port, old city of the Basque kingdom Navarra, possesses a prestigious history to be discovered. Walk in the steps of the Romans at Urkulu and in Pamplona, of Roland and Carlomagno in Roncesvalles, pilgrims of St James of Compostela, Henri IV, Vauban in the Citadel, Napoleon towards Pamplona.... Basque Pyreneans have preserved their natural aspect since 2 millenniums..... The library supplied by the owner Nathalie will help you to understand the Basque Country, this gorgeous region, where green mountains reign. Saint-Jean-Pied-of Port is an alive city, with its shops and famous restaurants, its historic district, frequented by pilgrims from all over the world, its market, its pelota parties, its celebrations, its cinema, its swimming pool, its walking paths,... all of this on foot from the Vertes Montagnes gite. As well ideal place of stay for discovering the Basque Country from Pamplona to Bayonne.